Caution: the glass ramekins can be very hot.<br>Handle glass ramekins with care. Remove sleeve and lids. 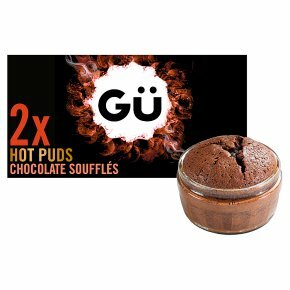 Put ramekins on a room temperature tray and place in a pre-heated oven at 160°C for 12 minutes (fan oven), 170°C for 13 minutes (non fan oven), gas-mark 3 (170°C) for 13 minutes.Don't overcook them, or they'll lose their Gü-ey centres!